Category: CONFERENCE TABLES	Tags: "Conference Room Tables, "Conference Table, "conference table design, "conference table india", "conference table price", "Conference Tables in Noida", "Conference Tables", "Modern Conference Tables"
Eleganc Conference room table are typically the largest piece of furniture and biggest expense of conference rooms. this is smaller but more intimate round tables with metal bases for improve meetings or brainstorming sessionsat meeting time. Eleganc designed office conference tables with rich major any finishes or modular tables with segmented tops and bases for flexible seating in an executive board room. 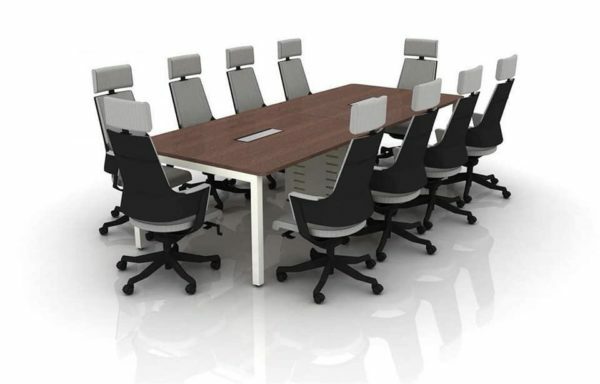 Browse our wide assortment of meeting room furniture that can seat up to 12 people comfortably. Eleganc Provide convenience for your clients using laptops by purchasing a table with wire management holes in the top that funnel cables to the base for concealment and prevent tripping hazards. This commercial meeting room table also supports smaller meeting spaces with a round table in traditional major stain or a contemporary styled square shaped laminate surface with aluminum legs for sleek contrast.